This page presents a listing of frequently asked questions about CircuitMaker. Click on a question to display its answer. For further, more detailed information on aspects of the software, use the links available in the panel to the right. How do I get CircuitMaker? To use CircuitMaker requires an account to be setup. This is achieved by registering to become part of the CircuitMaker Community - through the CircuitMaker website. Initial installation of CircuitMaker is performed using the CircuitMaker Installer. This wizard-based installer is accessed by running a small (approx. 9MB) executable – CircuitMakerSetup.exe. This executable is downloaded from the website, and can be saved anywhere on your hard disk. It is advised to change your password once the software is installed and you have logged into the CircuitMaker Community. To do so, from the Start page (View | System | Start) simply click the My Account link (in the Tasks pane). Then from the My Account page, click to access the Change Password page. I'm getting errors downloading and/or installing. What do I do? Generally, issues with downloading and installing CircuitMaker are related to firewalls and/or antivirus software. If you are having trouble, it is worth trying with them temporarily disabled. If you are still having issues please read the following FAQs first, then try searching the Forum. If you still have no luck, start a new thread on the Forum. What are the Firewall settings? I am getting an error message about an invalid security certificate, what should I do? 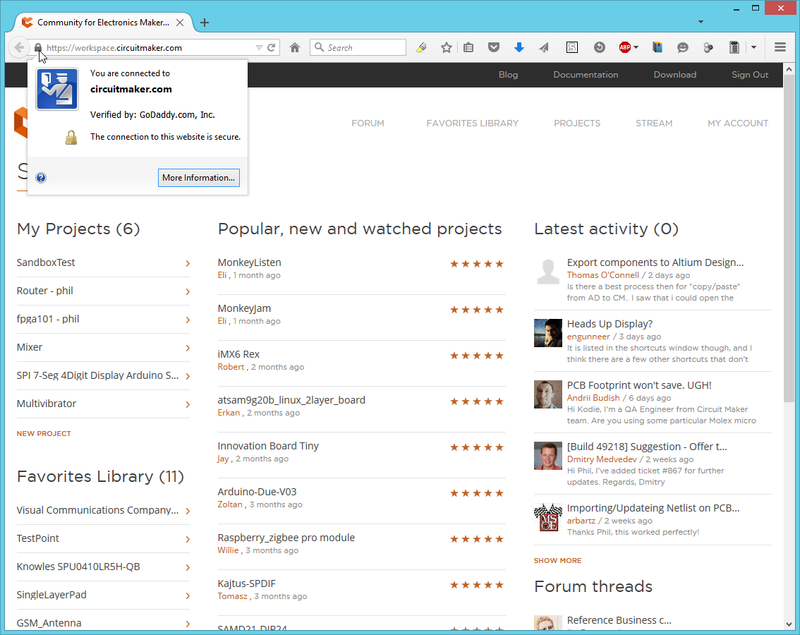 Open https://workspace.circuitmaker.com/ in Firefox. If the browser displays a similar error then you need to contact your IT department and make sure they can open this page. Your IT department can add the certificate to Firefox by select Options - Advanced - View Certificates, then click Import in the Certificate Manager. If you can open the Community page in Firefox but not in CircuitMaker, then you need to check who issued the certificate. To do this, click the lock icon at the left end of the Address field, as shown in the image below. If the certificate is issued by GoDaddy.com, then CircuitMaker should be able to connect as this is the issuer of CircuitMaker's certificate. If you still cannot connect then it is suggested you post a request for help on the CircuitMaker forum as there must be some other issue that needs to be resolved. If the Certificate is issued by some other authority then most likely your PC connects to the Internet via a proxy server, which replaces the CircuitMaker certificate with a certificate issued by your IT department. Because CircuitMaker uses the same certificate format as Firefox, this certificate can be copied from Firefox to CircuitMaker, using the additional steps described below. If you can see this page in Firefox on your computer, it means that Firefox now has access to the correct security certificate. The advantage of using Firefox is that the internal security certificate that is issued to it by your proxy server, can also be used in CircuitMaker. Because you can access the CircuitMaker site in Firefox, you should now be able to get CircuitMaker working too, by copying the internal certificate from Firefox to CircuitMaker. C:\Users\<YourUserName> search this folder for cert8.db , a number of copies may be found. Locate the Firefox certificate, it should be in a location like C:\Users\<YourUserName>\AppData\Roaming\Mozilla\Firefox\Profiles. Restart CircuitMaker, it should now connect to the Community site . I can log into CircuitMaker and see the public designs and forum topics but I cannot open a project, what should I do? CircuitMaker starts, I can see the public projects and also the Forum topics, but I cannot open any project. If I open the Libraries panel it says Please log in. For a number of designers this issue has turned out to be related to the Windows Internet Options, which was resolved by resetting them. Select Internet Options to open the Internet Properties dialog. Change to the Advanced tab, and click the Reset button. Check if you can now open a Project in CircuitMaker. If not, post a request for help on the CircuitMaker forum. Do I need to be signed in to my account to use the software? Alternatively, access the Extensions & Updates area by clicking the Extensions & Updates link, in the Tasks pane of CircuitMaker's Start page. Once there, click the Updates link to access the Updates page for the area. When a new version of the platform is available, a notification will be present in the Platform Updates region. Hover the mouse over anything inside CircuitMaker – a button, command, dialog, panel, or design object – and press F1 to access documentation for it. 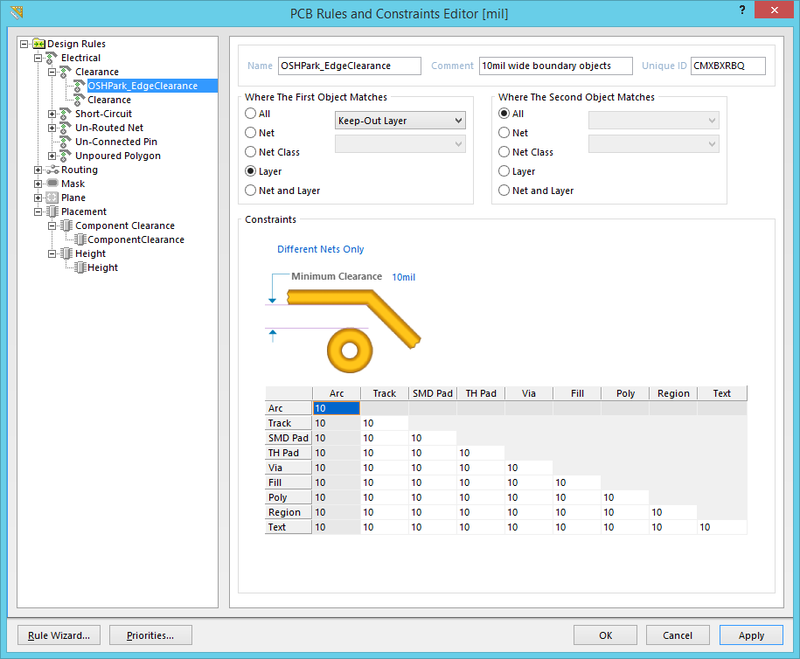 F1 also works for specific pages in the Preferences dialog, and specific rule constraint pages in the PCB Rules and Constraints Editor dialog. And if you're running a command, say you're placing a component and you're not sure how to rotate it, press Shift+F1 for a list of command-dependent shortcuts. Where can I find CircuitMaker tutorial videos? The CircuitMaker video tutorial series covers the entire PCB design process in CircuitMaker. You can find the videos over in the Video Vault. CircuitMaker employs online management of design components, facilitated through the integration of the Ciiva electronic parts database. Containing millions of unique parts across various manufacturers and distributors, you can get pricing, stock information, datasheets, and more, directly from within CircuitMaker. Hundreds of thousands of the components in the Ciiva database have a CircuitMaker component bound to them. These components reside in the secure, cloud-based Community Vault. And for those parts in the database that don't have an associated component, you can create one – with schematic symbol and PCB footprint, as required. You can even create custom components that don't exist anywhere in the Ciiva database! A user can simply search for a part in the Ciiva database – directly from within CircuitMaker's Libraries panel – and then use the associated Community Vault component in their design. No more libraries stored locally on a hard drive – rather, an impressive catalog of components built-upon, and ratified by, the design collective. You can even save frequently used versions of components to your own Favorites library! Where is my design stored? CircuitMaker is a community-based PCB design tool, where PCB design projects are made available to everyone in the design community – members can open a project for inspection, or create a new version from it (see Forking, below). To achieve this, CircuitMaker designs are stored in the cloud, in a free, community storage Vault. Using the Community Vault is completely transparent, as a designer you browse, create, open and save projects and project documents that are stored in the Vault, from within CircuitMaker. PCB projects stored in the Community Vault are available to everyone in the CircuitMaker community. Who owns my design work when it is in the CircuitMaker community? Different and/or additional copyright licenses, disclaimers, and notices. By using CircuitMaker you acknowledge that any project you post will be subject to one or more open source software or hardware licenses. The exact terms of GPL, LGPL, and some other licenses are provided to you with your particular product. Please refer to the exact terms of the GPL and LGPL at http://www.fsf.org (Free Software Foundation) or http://www.opensource.org (Open Source Initiative) regarding your rights under said license. Can design projects in the CircuitMaker community be used for commercial purposes? CircuitMaker is a full featured PCB design product that is designed for the open hardware community, regardless of whether designs are commercial or not. Is it possible to create a private project? CircuitMaker was created specifically for the maker and open hardware community, with the aim that designs are shared and visible to the public. Appreciating that you might not want to share your project until it has reached a suitable level of completeness, you can store up to 2 projects in your own private Sandbox. As you create a new Project you set the project to be either a Public project, or a Sandbox project. To switch an existing project from Sandbox to Public, select the project in the Community region of the Start page (not in the Tasks list), as shown in the animation below. Click the Edit button to open the Edit Project dialog, where you can switch the project from Sandbox to Public. Can I save a project locally on my computer? Storing designs and components in the Community Vault enables collaboration between users. CircuitMaker is an open hardware platform, and having those great shared community resources would not be possible if designs were stored locally on each user’s computer. Is there a MAC edition of CircuitMaker? While we appreciate the passion of Mac users, Altium products are currently only Windows-based. We will investigate support for Mac in the future, but do not make any promises of implementation, or time line. In the meantime, you can run CircuitMaker on Mac using Boot Camp® in conjunction with Parallels Desktop®, which works quite well. Is there a Linux edition of CircuitMaker? While we appreciate the passion of Linux users, Altium products are currently only Windows-based. We will investigate support for Linux in the future, but do not make any promises of implementation, or time line. In the meantime, you can run CircuitMaker by running Windows in a Virtual Machine on Linux. What are CircuitMaker's design limitations? Essentially, there are no limitations to CircuitMaker (aside from your imagination!). So there are no limits on layers used, size of board, number of components, or number of nets. I cannot access all dialog buttons in CircuitMaker, what can I do? As per the system requirements, CircuitMaker requires a minimum screen resolution of 1280 x 1024 pixels, for all dialogs to display correctly. It is possible to work on a screen with a lower resolution, for example 1024 x 768 or 1366 x 768, but it will require moving some dialogs around on the screen to access the buttons at the bottom of the dialog. This How-To Geeks article includes links to 2 versions of an AutoHotKey script that allow a dialog to easily be moved around the screen using a keystroke+mouse action, without needing access to the dialog title bar. The download available from the lower link also includes a compiled version of the script, which does not require AutoHotKey to be already running on your PC. The CircuitMaker Forum is the best place to report those bugs. Please provide as many details as possible, as well as images and any step-by-step instructions to recreate the issue. What is a CircuitMaker Component? From a designer's perspective, a CircuitMaker (or vault-based) component gathers together all information needed to represent that component across all design domains, within a single entity. It could therefore be thought of as a container in this respect. A 'bucket' into which all domain models and parametric information is stored. However, while a CircuitMaker component can, for convenience, be considered as a single package of data and models in the Community Vault, these elements are in fact separate. The vault component entity (or 'item') is composed of just the base ID and parametric information, and the models are separate vault items that are linked to the component item. Why can't I see the Community Vault? The Community Vault is not exposed to the user. CircuitMaker's streamlined interface means that all data sourcing and linking is performed in the background, negating the need (and additional complexity) to interact directly with the vault. Your central access point for CircuitMaker's automated component management system is the Libraries panel, while design projects are managed through the community's Projects area (from the Start page, simply click the link to Open Project). My part search in Ciiva returned no results. Why can't I find this part? It’s possible that you may be searching Ciiva with with the ‘Has Model’ box checked, which will only return results with symbol and footprint models attached. Unchecking this box will search the entire Ciiva database, and may reveal more part options for your design. If you have searched Ciiva with the ‘Has Model’ box unchecked and are still finding no results, it’s likely that your part is not in the Ciiva database at all. While the Ciiva database is enormous, there are still many parts out there not covered. In the future, we will explore options to expand our part database, even expanding to more part aggregators similar to Ciiva. In the meantime, you can always create a new custom component to fill the gap. Why are there Ciiva parts with no models? When you browse through the Ciiva components in the Libraries panel, you will notice that some components have symbol and footprint models, while others do not. If the Ciiva component does not have models, it means that there is no design component stored in the CircuitMaker Community Vault for that Ciiva component. 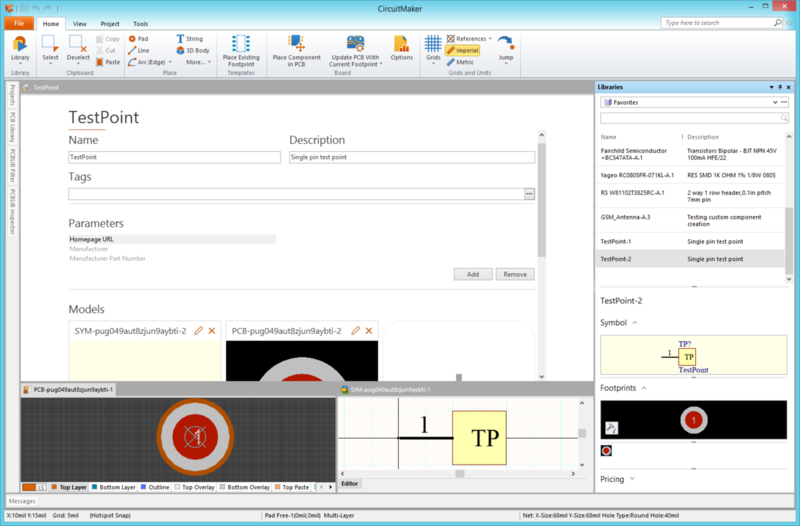 Any CircuitMaker designer can create a suitable CircuitMaker design component for a Ciiva component, which will then be available to all designers in the CircuitMaker community. You are also free to make a new version of any design component, if the existing version is not suitable for your requirements. Use commands available on the panel's right-click context menu to either build the initial component for a Ciiva part (where it doesn't exist), build a new version of the component (where it does), or build a completely custom component - if you can't find it in a search of the Ciiva database. Why does editing a component create a new version? This is the Community Vault's high integrity at play. To ensure no data is ever overwritten, each time an existing version of a component is edited, or a new version of that component is built, it is released (commited) to the vault into the next revision of the parent Component Item. Technically, the moment editing is invoked, the next planned revision of the Component Item is 'reserved', ensuring no other user can come along and release their own modification into that same revision, before the user has finished and either committed or discarded their changes. These different versions of a CircuitMaker component (technically, revisions of the vault-based Component Item), are distinguished by the revision id element of the component's full identifier (which appears in the form <Item Id>-<Revision ID>). For example CMP-1248485-A.1 is the first revision, CMP-1248485-A.2 is the next, and so on. What is the Favorites library? CircuitMaker offers the concept of a 'favorite collection' of components. These represent vault-based components that you created or edited, or any that you have manually added to the favorites list. Your Favorites library can be accessed through the Libraries panel, or through the Favorites Library section of CircuitMaker's Start page (View | System | Start). Building up a list of favorite components means that your preferred component options are easy to access and use in your designs. How do I create a custom component, such as a Testpoint? Right-click on the Libraries panel and select the Build a new Custom Component command. The component editor will open. In the component editor, enter a suitable Name and Description, then click to add the Symbol model. Place a Pin at the origin of the workspace (center of the sheet), then double-click to edit it and set the Display Name to TP and the Designator to 1 (does not have to be 1, as long as the PCB pad number matches whatever you use). Place a drawing object to represent the component, like a rectangle. If it obscures the pin details use the Tools | Components | Move » Send to Back command to push the rectangle behind the pin. To set the default designator, double-click on the symbol name in the SCH Library panel to open the Schematic Symbol Properties dialog, then enter TP? (or whatever you prefer) in the Default Designator field. Close the dialog. Save the Symbol (the Save button is up the top left). Return to the component and click to add the Footprint model. In the Footprint editor, place a pad at the workspace origin (0, 0). Edit it to the required size & hole size, and set the Pad Designator to 1 (or whatever value you used for the schematic pin designator). Return to the component, it should show the symbol and footprint now. Save the component, then click the Commit button to release it in your custom component area in the Community Vault and make it available for use. The component and the models windows will close automatically during this process. Set the Libraries panel to Favorites, scroll down and you should see your new component listed. It can now be placed on a schematic sheet, or into an open PCB. How do I create an SMD pad with a hole in it? Place a standard thru-hole pad, and edit it. Leave the Layer as Multi-layer and set the Designator as required. Edit the pad dimensions and Shape as required. Switch the pad from Simple to Top-Middle-Bottom. Doing this will display 2 additional rows with fields for the Middle layers' properties, and the Bottom layer properties. Set the X and Y dimensions of the Middle and Bottom layers to zero and the Shape to Round. Edit the hole size as required. Note that you can switch the units being used in the dialog via the menu that appears when you click the icon up the top left, or by pressing the Ctrl+Q shortcuts. Set the Plated checkbox as required. The animation below shows the process, with the display being switched to 3D mode to show the pad before it is edited, and after. How do I create a component with multiple parts in the one package? All of the parts must drawn as Parts of the same schematic component. When you're in the schematic symbol editor you'll find a New Part button on the Tools tab of the ribbon, when you click this a blank editing window will appear, have a look in the SCH Library panel and you'll see that you've created Part B for this component. If you were creating a connector, it now has 2 parts. Every physical pin that you want to connect to a unique pad on the PCB footprint must have a unique pin number in the schematic symbol, with the schematic pins divided across the 2 parts however you choose. You can use alpha-numeric pin designators if you want (for example if that's what the connector manufacturer recommends). Repeated pin designators can be used, typically this is done for things like mounting holes that you want to connect to ground (eg all are pin zero). It is the Pin Designator that really matters (not the Pin Name), and there needs to be a PCB pad with the same Pad Designator for the net to be correctly transferred from schematic to PCB. When you place a multi-part component on the schematic, the software will automatically first give you Part A, then if you click to place a second time it will give you Part B, and so on. If you place one then cancel out you'll have part A, the next time you place the same component it will be Part A again because you have recommenced the placement sequence. Any instance of a multi-part component that has been placed on the schematic can always be changed to any other part in that package. Double-click to edit the component, there are controls up the top left of the dialog that are used to select which part this instance is. All parts of the same multi-part component must have the same designator, for example P1. On the schematic they will be distinguished by the automatic addition of a suffix, like P1A, P1B, etc. You can choose between an Alpha or a Numeric suffix in the Schematic - General page of the Preferences dialog. The font used for the Pin Name and Pin Designator can be configured as a property of the pin in the symbol editor. Alternatively, instead of doing it for every individual pin, change the font used for all of the pins on entire schematic sheet by editing the System Font in the Document Options dialog. Double-click in the sheet border to open the dialog for the current schematic document. How do I position the STEP model on the PCB footprint? The STEP model is placed on to the PCB footprint, positioning it can be tricky because it may have a completely different 3 dimensional orientation to the footprint. To place the STEP model, click the Home | Place | 3D Body button. In the 3D Body dialog, set the 3D Model Type to Generic STEP Model. Click the Embed STEP Model button, then browse and locate the model. Place the model anywhere near the footprint pads, its exact location is not critical at this stage. After placing the model the 3D Body dialog will re-appear, ready to place another STEP model, click Cancel to close the dialog. To orient the model correctly, use the PCBLIB Inspector panel (View | PCB Library | Object Inspector). If the model does not include a suitable snap point or vertex to hold it by during positioning, add a Snap Point using the Tools | 3D Body | 3D Body Palcement » Add Snap Points from Verticies command. After launching the command, you first click to select the 3D Body you want to add the Snap Point to, as detailed on the Status bar. The command has 2 modes for adding a Snap Point, in the video below it shows how to add a Snap Point midway between 2 verticies, press the Spacebar to switch to this mode after you have clicked to select the STEP model. If you add a Snap Point at an incorrect location, double click on the 3D Body and delete the Snap Point down the bottom left of the dialog. Position the STEP model on the pads. Then use the PCBLIB Inspector panel to position the STEP model vertically if required, as shown in the video. The video shows these steps in detail. Can other members of the community collaborate on my project? Yes, absolutely! Catering for true collaborative design within the community, CircuitMaker facilitates the ability to create project teams. When browsing a project in the Projects area of the community, simply click the Team button to view the active participants for that project. By default, each newly created project is available for viewing by the whole of the CircuitMaker community - appearing as the Public entry, with Read access rights. In addition, the creator of the project, or Author, is assigned Full access rights. The project creator can add specific members of the community as contributing participants, simply by granting them editing rights. To do this, use the Add New Member link, search for the desired user, and set their access to Edit. Alternatively, any community member can request to become a contributing participant for another member's project. To do this, use the Add New Team Request link, choose Edit rights, and supply a reason why you want these rights. The requesting member can view requests they've made in their My Requests list. The project creator will receive requests in their Pending Participants list, from where they can consider a request and either grant or reject it accordingly. Forking (or branching for the software developers out there) is a feature that allows you to take a copy of an existing design project in the CircuitMaker Community. This allows you to effectively stand on the shoulders of others, taking a design to use as the basis for your own design, but without altering the original in any way. Forking facilitates design reuse at the higher level. While components offer low-level building blocks that are reused throughout designs, the designs themselves become higher-level building blocks. Other makers can simply pick up an existing design and reshape it to fit their needs. In turn, their new cool design is made available to the community. To copy an existing project in this way, simply click the Fork button when browsing that project within the community pages. A Tag is a descriptive label that can be applied to any component in your Favorites library (while browsing through the Libraries panel). By using tags, you can further filter the content of your Favorites - quickly grouping components together that possess the same tag. To apply tags to a selected component entry, right-click and select Tags from the context menu to open the Tags Editor dialog. Use this dialog to both create tags, and assign specific tags to the component as required. The tags you create and assign are personal to you. This means the way you organize your Favorites Library does not affect the way other users organize theirs. Can I create a project through the CircuitMaker website? Yes, absolutely! Simply go to workspace.circuitmaker.com and use the New Project link - located under the My Projects region of the presented Start page. Controls are available on the detailed page for the project, once created, to open it, edit it (its title and description), and delete it. When you use the Open button, you will be presented with a pop-up window in which to specify the executable to use. Provided you're browsing the website on the same PC on which CircuitMaker itself is installed, you can simply browse to the CircuitMaker executable (\Program Files (x86)\Altium\CM\DXP.exe for a default installation) - your design will be opened automatically in CircuitMaker once it launches. Add importers and exporters for your CircuitMaker installation by configuring the platform from within the Extensions & Updates area. My EAGLE design is not importing - why? CircuitMaker's EAGLE Importer is able to import EAGLE design files saved with EAGLE version 6.4.0 (or later). These are XML-format in nature – EAGLE binary-format design files cannot be imported directly using the EAGLE Importer. For these older, binary version design files, it is advised to save them in this later (XML) format, through your EAGLE software, before attempting to import into CircuitMaker. CircuitMaker can open Altium Schematic documents (*.SchDoc). You are therefore able to add existing documents of this kind to your CircuitMaker projects, irrespective of the product in which those schematics have been created (Altium Designer, PCBWorks, or CircuitStudio). To add one or more existing Altium schematics to your CircuitMaker project, simply right-click on the entry for that project - in the Projects panel - and choose the Add Existing to Project command from the context menu. Browse to, and select, the schematic document(s) to add. You will have the opportunity to change the name of each document involved, as part of the process. Note that CircuitMaker has its own PCB file format (*.CMPcbDoc). As such, the PCB documents created in other Altium products cannot be opened in CircuitMaker. You can also open Schematic library documents (*.SchLib) and PCB library documents (*PcbLib) in CircuitMaker, by dragging them from the Windows File Explorer and dropping them on to CircuitMaker. Symbol or footprint primitives can then be copied/pasted into a open CircuitMaker schematic symbol or PCB footprint editor. Is there support for variants? Variants that use any of these types of variations are all referred to as Assembly Variants, as they only impact on the assembly process - all variants share the same fabricated bare board. There is also support for variations to component overlay information on the PCB, for example changing a components' comment. This type of variation requires two overlay screens to be produced, resulting in two different bare boards. This type of variant is referred to as a Fabrication Variant. My project is private (in my Sandbox), do I need to Commit it? When you add schematics and a PCB to a new project, the are saved into a temporary cache on your hard drive. You can tell if a file is only being held in the cache because it will have a blue cross next to its name in the Projects panel, as can be seen in the image below. It is recommended that as well as saving the individual design files, that you also Commit the project. When you Commit a project all of the project documents are saved into the Community Vault. If your project is in your private sandbox those files in the Community Vault will continue to only be available to you, no one else can see them. You, as the owner of the project, can now access the Sandboxed project from any installation of CircuitMaker, from anywhere in the world, once you have logged in. Can I create a schematic template with my own logo? You can create your own schematic template, with your own logo or graphic on it. 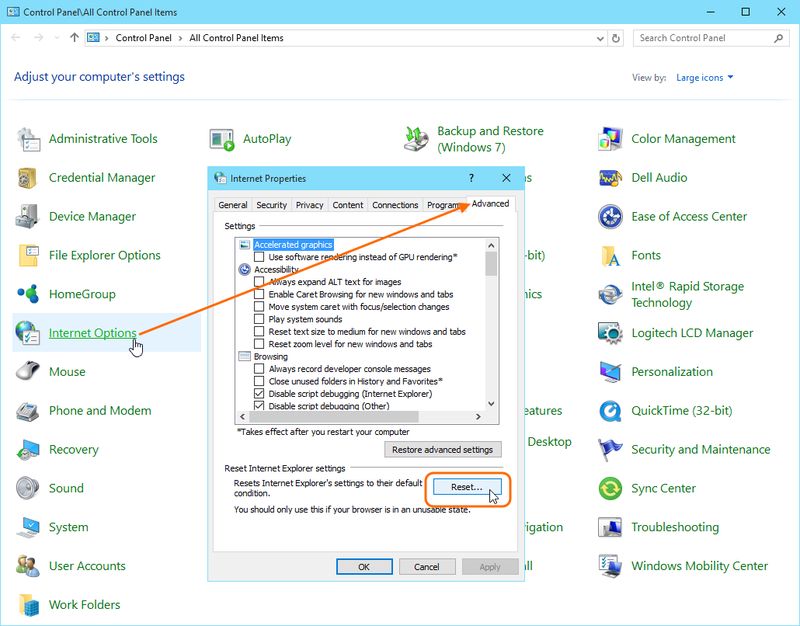 Locate the existing template you want to use with the Windows File Explorer in the location detailed above, and create a copy of it. Drag and drop your copy onto CircuitMaker. Double-click on the existing graphic, to open the Graphic dialog. Click the Browse button in the dialog, then locate and select your own image, once you have you will return to the Graphic dialog. Note that there is an Embedded checkbox, it is recommended that you embed the graphic. Note also the X:Y Ratio checkbox, enable this if you need to resize the image and want it to remain in proportion. Once you have positioned and sized the image, click the Save button to save the template, then close it. To use your template, open the schematic, double click in the sheet border to open the Document Options dialog, in the Templates tab you will be able to select your template in the dropdown. If you have multiple sheets to apply the new template to, it is easier to select Project | Content | Templates » and select your new template from the list. The Update Template dialog will be open where you can choose which documents to update, and how template parameter changes should be handled. How do I create a Net Class on the schematic? Nets are identified as members of a Net Class by having a Parameter attached, with the Parameter Name = ClassName, and the Value = <NetClassName>. Parameters are attached to nets by placing a Parameter Set directive so that it touches the wire, as detailed below. Place a Net Class parameter set directive on the net (shown below), so that it touches the wire. You can define a name for the object if required, but it is the Parameter that this object is attaching to the net that is important, it must have a parameter Name of ClassName, the Value is then used as the name of the net class you want the net being touched by the directive, to be included in. In the image below, the nets are being added to the SPI net class. Copy and paste the object onto each net you want included in the Net Class. In the Options for Project dialog, go to the Class Generation tab and enable the User-Defined Classes, Generate Net Classes option. Compile the project and Update the board, your PCB should now include a Net Class, with those nets as members. If you're adding the Parameter Set objects to a busy schematic, set the Style to Tiny to fit them in between adjacent wires. Which CAM output formats does CircuitMaker support? CircuitMaker can output Gerber (RS-274X) and ODB++ CAM formats. In addition, the PCB can be exported in STEP format. Can I import DWG or DXF outlines into the PCB editor? DWG and DXF files can be imported into a mechanical layer on an open PCB document, via the File » Import menu command. 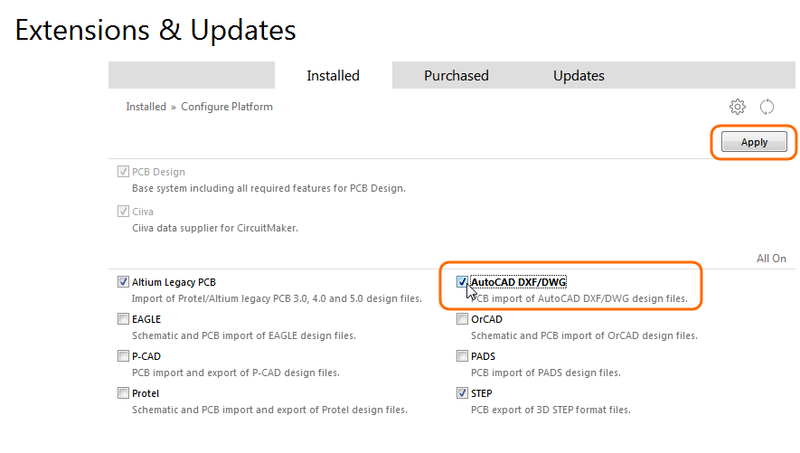 If the AutoCAD PCB Files (*.DXF; *.DWG) entry is not available in the supported file types dropdown of the Open dialog, it means that the AutoCAD DWG/DXF Importer is not installed. To install the Importer, click on Extensions & Updates in the Home View Tasks list, then click Configure to access the platform extensions, as shown below. Enable the AutoCAD DXF/DWG option and then click the Apply button to install the extension, the software will need to restart to complete the installation process. You will now be able to import DWG and DXF format data. How do I define the clearance from traces to the edge of the board? You do this by placing a boundary around the edge of the board on the Keep-Out layer using lines/arcs. These will place with the lines/arcs centreline right on the edge of the board shape (so they are half in the board and half outside). So if you placed a 10mil wide boundary, then 5mil of that would be inside the board. Press Tab as you are placing the first line to set the width, press Shift+Spacebar to change the corner mode and Spacebar to change the corner direction. You then use a Clearance design rule to specify how close objects can be placed to these boundary objects, keeping in mind that the clearance rule is from object edge to object edge. With 5mil of boundary object width and a clearance rule of 10mil you would get the required 15mil clearance. If this board edge clearance requirement is different from the default routing clearance you can create it as a separate design rule and name it accordingly. You would then scope it so that it applied between the objects on the Keep-Out layer - against all other objects, as shown in the image below. Set this rule to have a higher priority than the routing rule to ensure that it is always applied in preference to a routing rule that might allow routing to be closer than the 10mil clearance it requires. In the image you can see that it is listed higher up than the other Clearance rule, indicating that it has a higher priority. How do I make my ground net routing wider? Press Ctrl+H to launch the Select Connected Copper command (else go to Home | Clipboard | Select » Connected Copper). Click on the routing to select that entire net (tracks and pads). To include another net, hold Shift and click on that net too. Right-click once to drop out of net selection mode. Press F11 to open the PCB Inspector panel. Type in the new width value into the Width field in the PCB Inspector panel. Press Enter to apply the change. All selected tracks will have their width changed. The animation below shows the process. How do I define a circular board cutout? A board cutout is defined by placing a closed path made up of straight and curved edges. The Home | Board | Board Cutout command supports placing curved edges that are 45 or 90 degrees. The easiest way to define a cutout shape is to first define the shape using tracks and arcs on a mechanical layer, and then place the board cutout so that it follows the same path. This technique is straightforward when the path edges are straight, but is more difficult when there are arcs. One approach to help with this is to place a Center style dimension for each circle (or arc), which is sized/oriented to the circle (arc) size. Keep an eye on the Status bar as you place the dimension to see what step in the placement sequence you are up to. With the dimension present, as you place the board cutout in the 90 degree arc-in-corner mode, it will snap to the ends of the dimension cross, making it easy to get the correct radius and start/stop angle for the arc. The animation below shows the process, including the keystrokes used to switch corner modes (Shift+Space), and the corner direction (Space). The animation does not show how to resize the arc-in-corner when it is too small. Hold the , key to make the arc radius smaller or the . key to make it bigger, include the Shift key to speed up resizing. How do I split a ground or power plane? Plane layers are defined in the negative, so objects you place on a plane layer become copper-free areas. Make the plane layer the active, or current layer. Click to run the Home | Place | Line command, the cursor will change to a crosshair. The software adds a border to each plane layer, referred to as the Pullback, click to start line placement on the center of the Pullback border. The Pullback ensures that the plane layer copper does not continue to the very edge of the board, its size is defined in the Layer Stack Manager. Before placing the first line object, press the Tab key to open the Line Constraints dialog where you enter the width of the line (which becomes the size of the gap between the plane regions). Set this as required. Place lines/arcs across the board to split of the required region. As you are placing lines/arcs you can change corner modes by pressing Shift+Space, and the corner direction by pressing Space. Once you have reached a board edge or existing split edge, right-click or press Esc to drop out of Line placement mode. Once the split path defined by the lines/arcs breaks the plane into separate areas, the software will automatically recognise each area as being separate - double-click on each to assign the net to that area. You can modify the shape of an area by moving / replacing the line objects, if you do you must confirm that each area is still assigned the correct net afterwards. Split regions do not have to touch the edge of the board, they can be islands, and can also be nested. Each split area takes on the color of the net assigned to it, double-click on a Net name in the PCB panel to assign its color. When I upload my Gerber and NC drill files to OSH Park I get an error about the board size, what should I do? But my board is larger than this. PCB fabricators need to know where the outline of the board is. While CircuitMaker uses the board shape during the design process, this shape is not used during output generation, so the OSH Park software might not have a layer available that contains suitable outline data. CircuitMaker includes a dedicated mechanical layer, called Outline, where the outline of the board shape (as well as any board cutouts) should be defined. Note that the outline can also be defined on the Keep-Out layer, while this is not OSH Park's preferred layer for the board outline it can be used, but it is important that you only include either the Outline layer or the Keep-Out layer in your Gerber file-set, but not both. Make the Outline layer the active (current) layer. Run the Home | Board | Board Shape » Create Primitives from Board Shape command, the Line/Arc Primitives from Board Shape dialog will open. Using this dialog, you can create a set of primitives that exactly follow the board outline, on the layer of your choice. The primitives can be placed so their centerline is on the edge of the board, or they can be placed so their edge touches the edge of the board (by enabling the Route Tool Outline option). You must consult with the fabricator before using this option, as they typically expect to be given centerline definitions for the board edge and cutouts, which they then process to define the actual rout path to suit their routing machine. Enter a suitable Width, such as 5mil or 0.1mm, and set the Layer to Outline. If the board includes cutouts, enable the Include Cutouts option. Click OK to close the dialog and create the outline. Do not include any other detail on the Outline layer, such as dimensions, that is outside the board outline, as the automated fabrication analysis software assumes that the board area is within the smallest rectangle that encloses all objects on the Outline layer. They do recommend including the string Cut Out within each internal cutout, to assist their CAM engineer in identifying any PCB cutouts, but this is not essential. In the Layers tab of the Gerber Setup dialog, ensure the Outline layer is enabled as a Plot Layer. Unless you have used a mechanical layer for a specific, Gerber-related function, such as glue dots or peelable solder mask definitions, ensure that the mechanical layers are not enabled as Plot Layers. Including layers that do not contain fabrication data can cause problems for automated fabrication analysis software. When generating fabriction output files, always ensure that the Gerber Units and Format settings match the NC Drill Unit and Format settings, and that both use the same Position on Film setting, for example Reference to Relative Origin.